It was the 17th of July and I came to the realization that the month was more than half over, summer was slipping away. Days for summer activities, including trips to the beach, and sampling all these summer-inspired beverages, are numbered…. There is nothing terribly unique about this drink, other than the look of it (click here for the original recipe and photo) – it’s one of those fancy layered drinks that I’ve been wanting to experiment with. This one separates into a distinct blue and golden yellow. I’m not quite sure what makes that reminiscent of a blue polka dot bikini…but we’ll go with it. I had the ingredients on hand, so I figured it was worth mixing up. Start by pouring the blue curacao in the bottom of the martini glass. The original recipe calls for 1/2 oz – I used more in order to get it filled to a similar level in my glass (apparently it’s wider than the sample glass). Next, add ice, coconut rum, and juices to the shaker. Shake and strain INTO A SEPARATE GLASS. 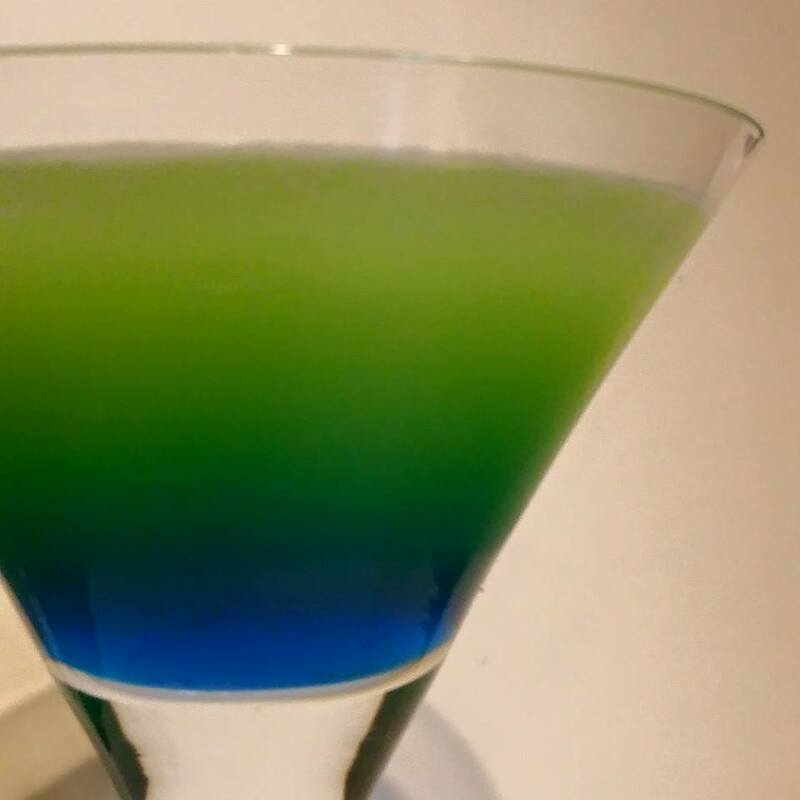 Slowly spoon the rum-juice mixture into the martini glass over the blue curacao. Take my advice with using the spoon. This wasn’t extremely clear in the original directions (it said, “using a spoon, gently pour chilled mixture over top of the Blue Curacao”) – so I did more pouring, albeit slowly, than spooning. The result was a drink that ended up looking more like some of my festive green drinks from March. Using the spoon is a slow process – especially if you are thirsty or are serving drinks for guests. And even with the extra care and effort I took on the second try, I ended up with more of a turquoise middle layer than a distinct two-layered drink. As far as the drink, it’s tasty…sweet…not remarkably unique. It was a little different to get the flavor burst of blue curacao at the end. But, the drink just looks neat…and, in terms of a drink-preparing technique, it’s one I’d like to continue trying to master.